Washington State family obtains a $1.4 million recovery for the wrongful death of their son killed in a bicycle/auto collision. Texas woman obtains $315,000 for premises liability injury. Ramrod Key resident recovers $200,000 for knee and wrist injuries in auto/scooter collision. Winter Park family obtains $858,863 for the wrongful death of 33-year-old husband and father who fell off a ladder. Texas wife obtains $585,000 settlement for drowning death of her husband. Boca Raton, FL resident obtains $130,000 for fractured ankle sustained as she was stepping out of pedicab. Our historic office in Key West, recognized by the Florida Bar with the “Historic Building Renovation Award” for design, was originally constructed in the era of 1912-1920. 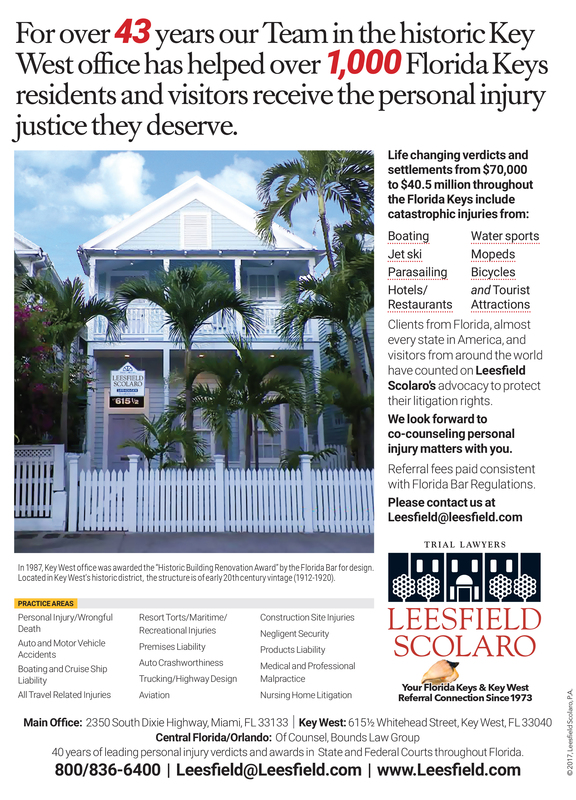 This 100-year-old historic building now has housed the offices of Leesfield Scolaro since 1987, and serves as an anchor for our firm, clients and law firms throughout the Florida Keys, not to mention the significant interest by lawyers throughout the United States in co-counseling matters with our Firm. 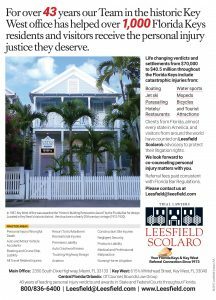 This year, in the Keys, included a jury verdict by lawyers Justin Shapiro and Adam Rose in a three-day trial before Judge Bonnie Helms. Numerous hearings were conducted in the Monroe County Courthouse, and a significant number of depositions, mediations and arbitration proceedings took place with our lawyers at the Key West office. On the community front, our Firm continues to support Marques Butler Memorial Annual Softball Tournament held in Key West honoring the spirit and memory of Marques “Squeeze” Butler who passed away in 2009 at the age of 23. As we get ready for 2018, we are planning our Annual Conch Fritter get-together and CLE luncheon program in March held for the past 22 years. Details to follow on this important seminar with CLE credits and a fun night at the Leesfield Scolaro office. Our Firm’s 43-year track record in Key West and the Florida Keys puts us in the forefront of leading verdicts and settlements as well as a strong commitment to the Keys community.